Supracolor Soft Watercolor Pencils are soft and creamy, in fact, they have the same texture as a 6B pencil. The 3.8mm cores are made using more pure color pigments, resulting in bright colors, excellent lightfastness, and superior blending. The bold, highly pigmented colors allow for excellent surface coverage, meaning that they are very economical and perfect for large surface artwork. Supracolor watersoluble colored pencils are relatively permanent when dry so you can create overlays of color without worrying that your piece will become muddy. Use a fixative on finished artwork to preserve the color and protect it from oily hands, moisture, mildew and dirt. Use to create fabric designs for clothes, quilts and tapestries. Just apply to wet fabric, wait for piece to dry, then heat set with an iron. Use to create your own take-along palette. Just draw a patch of each color on a separate piece of paper. Apply a wet brush and you can use the drawn color to paint with! Use in conjunction with the line of Caran D'Ache Pablo Colored Pencils to create both fine detail and flowing washes of color! Sprinkle dry shavings (created with sandpaper) onto a wet surface for a brilliant color burst effect. Take color directly from the core of the pencil with a damp brush. 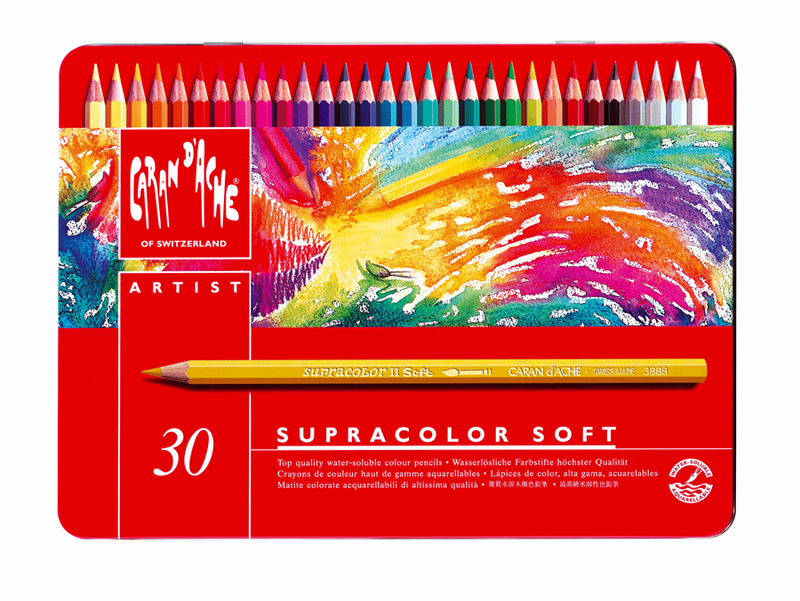 Find Supracolor Watersoluble Pencils here.